I was out looking at a seedling yesterday and saw the orange blob climbing out of the mulch onto the seedling. The appearance was of a dry powdery deposit. On touching with a stick I realized it was actually slimy n wet. Almost like a deep yellow orangish custard. I looked it up and came across an article "What is the Orange Fungus Growing in my mulch?" Interesting read. Anyone experienced this and do you need to manage it or is it a good thing? Oh god thank you. I always wondered what that vomit I keep finding around was. Probably what we call dog vomit fungus. Slime molds are fascinating "animals". They're technically not plants, not animals, not fungi... they're sort of colonial amoebas, that can live either as microscopic individuals, or join together to act as a single organism. And when they do, they're probably the smartest thing in the world without a brain. Not only can they do feats like solve the shortest path between two points in a maze, but they can actually learn. For example, if you make it get cold at regular intervals, or a short period of time after a particular stimulus, they'll start preparing for the cold before it happens. If you put down a line of a "unpleasant" (but not dangerous) chemical between them and food, they'll at first recoil from it, but after discovering that it doesn't harm them, will start ignoring it. Etc. Really amazing things. They're generally harmless to plants (eating bacteria and fungi), and might even do you a favour, so I'd just leave them be. You are a wealth of information. Thanks for sharing! It is also edible. But I would prefer to eat better types of Fungi. Its back and with a vengeance. And this time it does not limit itself to mulched plants. 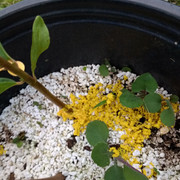 It grew in a pot that had an almost pure sand mix for dragon fruit seedling. It grew on a hose sitting in a patch of grass. Its grown in several pots, anywhere it can get a foothold. Unfortunately, it covered a small mongo seedling killing it. 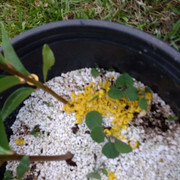 The dragon fruit seedling looks like it will be OK and some pineapples that it grew on are no worse once washed it off. I will leave them be so long as they are not smothering any small plants but it appears these will be a fixture in my yard this year. it does make sense but had not crossed my mind.